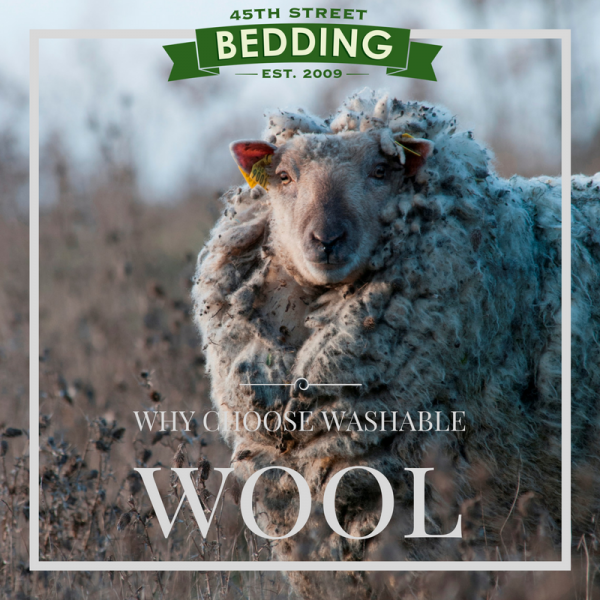 At 45th Street Bedding, we love wool. Our motto is “Wool is Wonderful” (we actually don’t have a motto, but this would make a pretty good one, don’t you think?). There are a lot of bedding materials on the market. I mean, A LOT. And some of them are great. Bamboo, cotton, latex. We like and use all of these. But the bottom line is: Wool is the best when it comes to keeping you cool and comfortable. No competition. Not convinced? Keep reading; we’ll explore the reasons why you should choose wool throughout the length of this article. We’ll also talk about our Washable Wool Bedding. Because what’s better than cozy wool? Cozy wool you can wash! Chances are you’ve heard how luxurious and comfortable down bedding is. This is true to a point. While down – the layer of fine feathers that grows under the tougher exterior feathers of a bird – is a good product, it’s really not cut out for sleep. Wool performs much better when it comes to bedding. The down feathers of birds exist to keep them warm and to keep moisture from penetrating to their skin. This is great for the bird, but bad for people trying to get a good night’s sleep. Why? Because when we sleep, we naturally perspire. If that moisture can’t be wicked away by our bedding, it remains stuck to our body, and we sleep hot. This leads to interrupted, unrestful nights. Wool, on the other hand, is naturally moisture wicking. This means it absorbs the moisture from your body and lets it quickly evaporate. So while you’re naturally perspiring throughout the night, your bedding is hard at work to make sure you stay comfortable and asleep. Those Zzzz’s are important. Wool knows this and it’s there for you. No matter what, it’s got your back. Here at 45th Street Bedding, we’re committed not only to products that last, but are healthier, too. It’s something we’re known for in the Seattle community and beyond; we’re pretty proud of that. Normally, wool clumps together and becomes inconsistent when put through the washing machine. This is because untreated wool is covered in scales (think of a shampoo commercial example showing how hair looks before it’s treated with their revolutionary product). Once these scales are removed, the wool can go through a washing cycle without issue. Three processes exist to make wool washable: Plasticizing, Bleaching, and Hydrogen Peroxide. All three are fairly similar: The wool is either sprayed or soaked in a chemical solution, rinsed with water, carted, and rolled into thick fabric spools, ready to be added to different bedding products. What changes is the chemical used to do the job. This chemical makes all the difference in the final product you receive. Let’s take a look at each process, shall we? This is pretty much just what it sounds like. The wool is coated in a thin layer of plastic to make it washable. The problem with this process is that the wool is no longer able to wick moisture away from the body. Wool fibers are full of tiny air pockets. These pockets absorb the moisture from our bodies and then this moisture is able to quickly evaporate. The plastic creates a coating around the fibers, trapping these natural air pockets in a seal. The wool still provides warmth, but all that moisture your body produces in the night now has nowhere to go, and remains trapped against your skin. Basically, this wool is no better than down at keeping you cool and comfortable at night. In this process, the wool takes a bath in a tub of bleach. The bleach bath strips away the scales (good), but can leave behind a toxic residue (bad), even though the wool is rinsed with water afterwords. Yikes! Toxic residue is not something you want to worry about when it comes to your sleeping surface. Just like bleaching, this process involves soaking the wool in a hydrogen peroxide bath to eliminate scales on the fibers. The difference? Hydrogen Peroxide is non-toxic to humans. This means a finished product with no risk of exposure to harmful chemical residue. We like this because the health of customers is important to us. We see no benefit in making a product washable if one of the side effects is exposure to potentially harmful chemicals.